This free online Word Searches game trains your visual perception, concentration, and pattern recognition. This is an HTML5 game. It does not require the Adobe Flash Player. This game has 20 different word search categories. 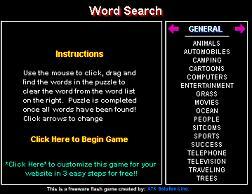 After the game loads, click the pink arrow buttons to choose a word search to solve (General, Animals, Automobiles, etc.) Then click the "Click Here to Begin Game" link. With the word search game above, you can play the same category multiple times because the words are scrambled each time. HOW TO PLAY. Here's how to play the word search game above. The category of words in your word search are listed on the right side of the game. To select which list of words you want in your puzzle, click the arrow to the right of the "GENERAL" heading. After selecting the category, click the "Click Here to Begin Game" link to start playing. The list of words you selected loads into the puzzle. Carefully look through the rows and columns in the puzzle. See how many words from your word list you can find! When you find a word, circle it. To circle a word, simply drag the mouse from one side of the word to the other. The word is crossed from the list automatically. To exit and start over, click the "Quit" link on the lower right. ... as well as Rock Bands, Sitcoms, Star Wars, Sports, MLB Teams, NBA Teams, NFL Teams, NHL Teams, US States, and Video Games. Below are some online word searches that I made myself. Click the link to go to the page for that puzzle. If you prefer solving word searches using paper and pencil, go to my Word Search Printables page where you can print all these out. I even have simplified printable Special Needs Word Search puzzles for children or adults with autism, severe ADHD, or other cognitive issues. Also free, of course! I hope you enjoy these free online Word Searches! Word searches are one of my favorite types of puzzle. Game distributed by ATK Solutions Inc. Used with Permission.